Records at Arlington National Cemetery suggest that workers found an urn of cremated remains that had been dumped -- presumably accidentally -- in a dirt landfill, reburied those remains as an unknown soldier, and kept the whole thing quiet. With the publication of this article, Salon has now disclosed four separate cases in which the cemetery discovered unmarked remains due to burial glitches, mostly poor record-keeping. In a fifth case, the cemetery accidentally buried the remains of one service member on top of another in the same grave. Salon's reporting has led the Army to launch an investigation of record-keeping problems at the cemetery. Gravestones simply marked "Unknown" are easy to find scattered throughout the sprawling acres of perfectly aligned headstones at Arlington. In addition to the famous Tomb of the Unknowns, there are hundreds, perhaps thousands, of unknown soldiers buried there, dating back to the Civil War. But a Salon investigation has turned up internal cemetery records that show that sloppy record-keeping, not the ravages of war, blurred the identities of some of those unknown soldiers at Arlington. In some cases cemetery officials lost track of the identity of remains during burial operations and simply erected an "Unknown" headstone above those graves when they could not straighten it out. 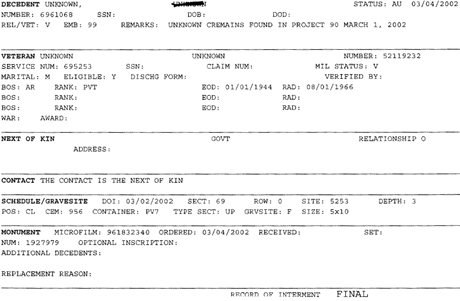 In the case of the urn apparently found in the dirt landfill, the internal cemetery burial records read: "Unknown cremains found in Project 90 March 1, 2002." "Project 90" refers to the year, 1990, when construction was supposed to begin on 40 acres of then-vacant land on the eastern edge of the cemetery along Jefferson Davis Highway. Work finally began on that undeveloped land in the spring of 2005, and it is now cleared and ready for more graves. 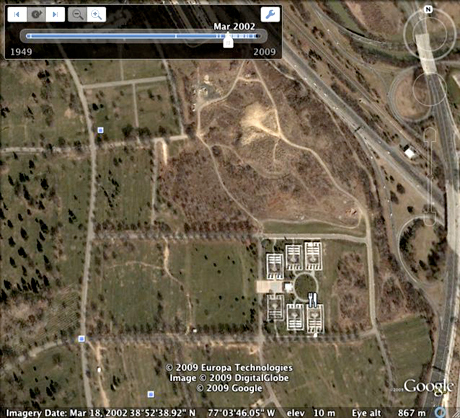 In March 2002, however, Arlington used Project 90 land only as a vast repository for excess dirt from graves -- a landfill -- according to interviews with former cemetery workers, satellite images, and pictures of that area from the cemetery's own Web site. Today, the new dirt landfill is located just to the southwest of Project 90. The documents in this case show that the day after discovering the urn in 2002, cemetery officials had it buried three feet down in grave 5253 of Section 69 of the cemetery. 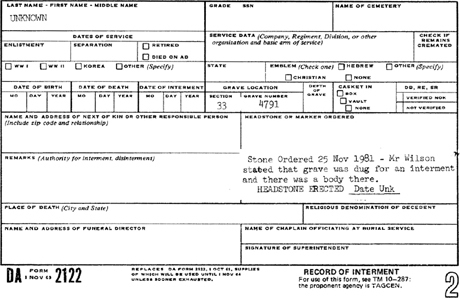 Officials then ordered an "Unknown" headstone, according to the documents. That headstone still stands there, near a stone wall, in an out-of-the-way section of the cemetery at the very southern edge of the sprawling grounds. A headstone stands at grave 5253. Cemetery records suggest workers found an unidentifiable urn in the cemetery's dirt landfill and buried it here. Salon has also obtained burial records for another unknown grave, No. 4791 in Section 33 of the cemetery. Burial records show that on Nov. 25, 1981, the cemetery ordered an unknown marker after workers went to bury a service member in that plot and "that grave was dug for an interment and there was a body there." The headstones labeled "Unknown" above the urn that was apparently fished from the landfill in 2002 and above the remains from 1981 are unremarkable. A passerby would probably assume the remains were rendered unidentifiable from some war long ago. Previous statements from top cemetery officials on these issues have proved to be conflicting or incorrect. The cemetery spokeswoman, Kaitlin Horst, recently informed Salon that the cemetery would not answer any more questions about Salon's reporting. The reason? Army Secretary John McHugh recently announced an investigation into the issues already raised in this series of articles. "It would be inappropriate to comment further due to the ongoing investigation by the Army inspector general's office," Horst told Salon. "Anyone with information pertinent to the investigation should contact the Army inspector general's office." The Army, which oversees Arlington, responded likewise. "Anyone with information pertinent to the investigation should contact the Army inspector general's office," spokesman Gary Tallman said. The remains found in the cemetery landfill are a disturbing new wrinkle in the story of botched paperwork that has resulted in an unknown number of burial mix-ups at Arlington. Sources familiar with Arlington's operations have long argued that some whole urns containing cremated remains likely go into the landfill, sometimes referred to as the "borrow pit," but could not provide hard evidence until now. The burial records for grave 4791. It says workers found a "body there" when digging in what was supposed to be an empty plot. 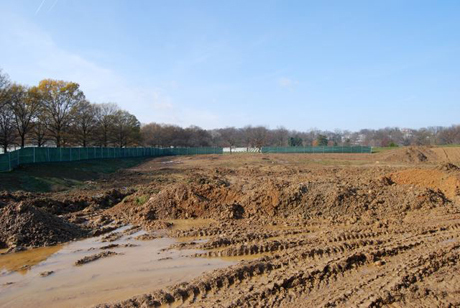 A photo of Arlington's dirt landfill recently. It's located just southwest of where it was in 2002. In the meantime, no one knows how common these burial mishaps and urn troubles are. The total number of urns that have ended up in the dirt landfill at Arlington is unknown. 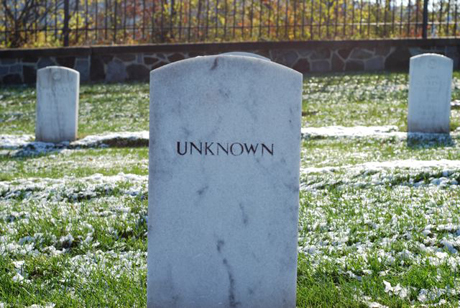 The total number of burial screw-ups hidden beneath headstones labeled "Unknown" is also unclear. And the total number of unknown remains underneath patches of empty grass at Arlington, with no headstone at all, also remains a mystery.